Kids say our colorful 1980s costumes are totally awesome. These rad looks from Candy Apple Costumes are now available in children's and teen sizes. Shop our full rock star and pop singer costume sets, or mix and match '80s costume accessories ranging from big-hair wigs to neon jewelry and sunglasses. We have the most wicked '80s kids costumes anywhere! Even if the '80s happened before they were born, kids know about this special time from their parents and the flamboyant '80s style lives from today's popular culture. 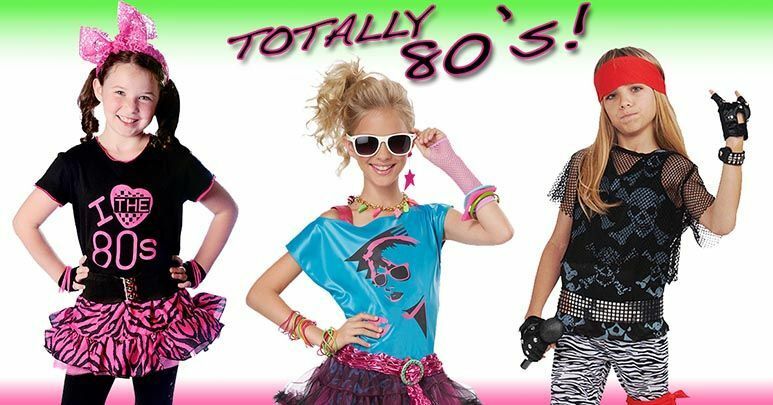 Our kids' '80s costumes and accessories are perfect for Halloween and '80s theme parties. They might even want to rock one of these looks for a special day at school or a friend's birthday bash! Check out adult costumes, 80's wigs and accessories in our Awesome '80s section! Children of all ages can relive the 1980s in grand style. For infants and toddlers, we have bright blue Smurfs costumes inspired by the popular 1980s cartoon show. Kids can play characters from top '80s movies like "Top Gun" and the "Indiana Jones" movie series. We have diva costumes inspired by Madonna, Super Mario Brothers costumes and valley girl outfits. These top-quality '80s costumes for kids are highly appropriate and accurate to this unforgettable decade, with plenty of flash. The quality and selection is far better than what you find elsewhere, and we offer these deluxe costumes to you at low prices. These costumes are sized to fit children and teens, and since each costume has its own unique sizing, you'll find detailed sizing information for every product. Use our customized size charts to find the best fit for kids, tweens and teens. We carry child-size Class Nerd costumes and girly glam rocker looks with plenty of sparkle. Shop our '80s era leg warmers, shoes and pendants. Older teens can also shop our adult-size 1980s costumes and accessories, including inflatable guitars for friends who want to arrive at the costume party in full punk rock band mode.